I can already hear the creak of the step stool hinge unfolding the second I tell my 4-year old daughter that I’m about to bake something that involves sprinkles. That’s her cue to drop what she’s doing and get herself propped up next to me at the kitchen island to get involved in the action. 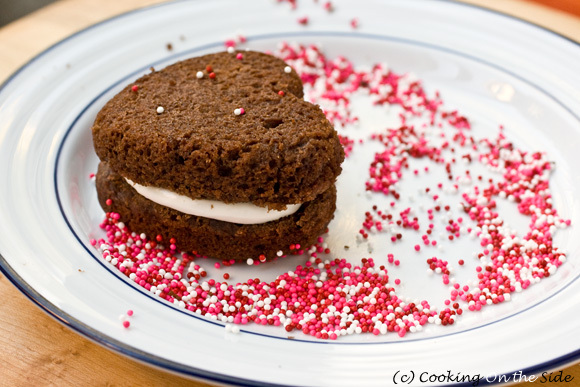 This weekend Heart-Shaped Whoopie Pies were on the menu. We had so much fun with the Bunny Whoopie Pies we made last year at Easter that I was eager to try some for Valentine’s Day. If you’ve never tasted a whoopie pie, these pillowy cakes with marshmallow frosting sandwiched in between are a real treat. Once again, we turned to a Wilton pan (included in today’s giveaway!) to create the fun shape. We decorated them simply with Valentine’s sprinkles around the edges but you can also get really creative and pipe words and other designs on top (like these from Baking Bites). 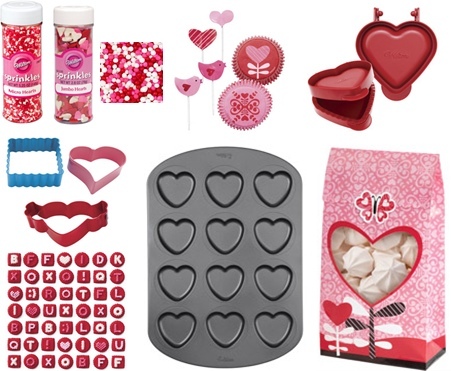 Leave a comment at the very end of this post telling us what Valentine’s Day treat(s) you’re hoping to make this year. The giveaway will close on Wednesday, February 8 at noon PST. I will use random.org to select one winner and I will announce the winner in this post. I will contact the winner via e-mail – if I don’t receive a response within 5 days I will draw another name. My apologies to international readers, the prize can only be shipped to U.S. addresses. Preheat the oven to 350°F. Lightly spray the whoopie pie pan with nonstick cooking spray. In a large bowl, beat the butter and sugar with an electric mixer on medium speed until it’s light and fluffy, about 3 minutes. Add the egg and vanilla; beat until well combined. In another bowl, sift together the flour, cocoa powder, baking powder, baking soda and salt. Add half the dry ingredients into the butter mixture and mix on low speed. When the dry ingredients are almost incorporated, stop the mixer and add the buttermilk. Continue to mix on low speed until all ingredients are almost incorporated. Stop the mixer and add the remaining dry ingredients. Mix on low until just combined. Spoon 2 tablespoons of batter into each cavity; spread the batter to the edges (I got more even tops when I smoothed them with a rubber spatula). The cavity should be about 2/3 full. Bake for 8-10 minutes or until the top of the cake springs back when touched. Allow the cakes to cool in the pan for 8 minutes. Remove from pan and cool completely before filling. To assemble the pies spread filling on one cake and sandwich with another cake. In a large bowl, beat the butter with an electric mixer until it’s creamy. Add the sugar and salt to the butter, mix well. Add the marshmallow creme and vanilla; blend well. Use immediately to fill the whoopie pies or refrigerate covered up to 1 week. Bring back to room temperature and lightly beat before using. Many thanks to Wilton for sponsoring today’s giveaway. I am looking forward to making a strawberry cheesecake. What V-Day treats and I thinking of making fudge brownies. I love brownies and they are just a great comfort/love food. Though I wouldn’t mind making these whoopie pies. A giant heart shaped cookie! What a cute idea! I planned to make cookies to share at work, but these look a bit more fun! I’m hoping to make cake pops this year! I’ll be making oreo cheesecake truffles. I plan on making these tiny ladybugs again (lovebugs! http://www.facebook.com/photo.php?fbid=562407274376&set=a.519946840426.2027892.22501825&type=3&theater ) for Valentine’s, among other cut-out cookies! I’m thinking of making a heart-shaped meringue and filling it with raspberries. I’ll probably make some chocolate meringue cookies while I’m at it. Those whoopie pies look wonderful! This year for my daughter’s class, we’re going to make things easy on ourselves and make chocolate chip cookies with a twist. We bought some cherry flavoured M&Ms to put in them too! I haven’t seen cherry M&Ms yet – how cool, I need to find those! Like you FB…I thought I already did, but apparently not! I can’t wait to make boston cream pie cupcakes for my sweetheart! Subscribed by RSS feed to your site! I’m hoping to make graham crackers and heart-shaped shortbread. Maybe even chocolate dipped. I’ll be making Star Wars shaped chocolates for my bf for Valentine’s Day this year! Mary´s last blog post ..sam the cooking guy: live onstage / win tickets to see sam! Thank you for posting these instructions and recipes!!! I have a Wilton Heart-Shaped Whoopie Pie pan that came with no paper work. 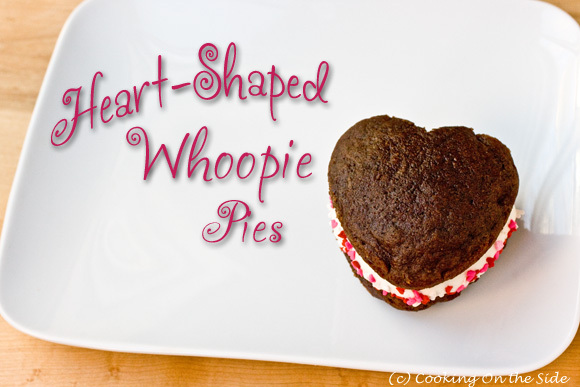 Now, thx to you, I can make Whoopie Pies for today==Valentines Day! I am going to try making the cake part from a cake mix and then make the filling recipe…wish me luck!! I’m making them for dinner tonight for my Mom and Hubby. Hubby is making Surf & Turf for dinner…I thought this would be the perfect dessert! Have a love-filled, fun-filled Valentines Day! I made these last Sunday, the cakes were way to big so I cut down the amount of dough and that worked better, smoothing them out with a knife before baking also helped. The frosting was like soup and I have made a lot of Whoopie pies in the past. I followed the recipe and even my husband said, “what happened to the filling?” The cake tasted fine but the filling was not good at all. Sorry to hear the filling didn’t work out for you. I hope you didn’t maybe leave out an ingredient? Or perhaps melt the butter rather than soften it? Between the marshmallow cream, sugar and solid-state butter it would be pretty hard for it to turn out like soup – there’s nothing liquid in it but a small amount of vanilla. It sounds like something didn’t go quite right. Glad the cakes tasted good!